Thank you to everyone who has sent in photographs of places around Guernsey. The children have enjoyed looking at maps and Google Earth to find the different places. Please continue to send in photos as you go out and about to different places at the weekends as we will display these on our walls. Thank you as well to everyone who has bought in Autumn objects – the children are enjoying drawing and finding out about them. 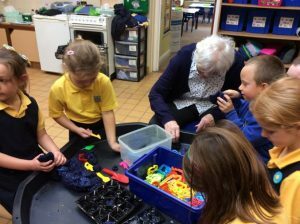 Yesterday Mrs Bramley’s class had some visitors from Le Platon Residential Home. 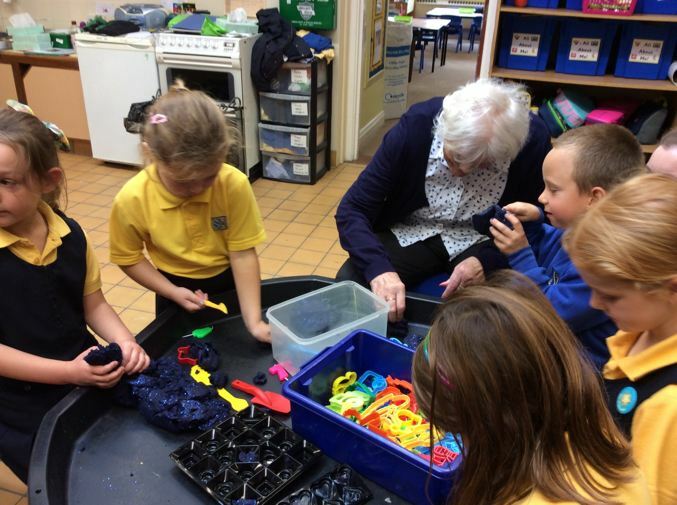 The visitors enjoyed meeting the children and working alongside them in the Discovery Zone. Some of the children also read their reading books to the visitors. 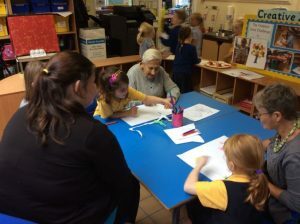 The residents will be visiting Mrs Bramley’s class every Thursday. We have a busy week coming up next week. On Monday there will be a whole school assembly to launch Guernsey Recycling Week. As was mentioned in the letter that you have already received, please could children bring in a empty, clean tin or can to recycle on this day. In our literacy lessons we will be doing some follow up work about recycling and encouraging the children to recycle their rubbish in class. In maths next we will begin to start work on number bonds which will be the theme for our Rainbow Maths Targets. Please click here for some activities focused on number bonds which you might like to do at home with your child. On Friday we will be launching our ‘All about me’ topic with a visit from The Explorer Dome. The focus of this will be ‘our body’. The PTA work really hard throughout the year to put on events for the children to enjoy however these can only go ahead with the support of parents to help. The Halloween disco is coming up soon (for details please see the poster below) and the PTA need some more parents to volunteer to help for the hour while their children are at the disco. Help is needed to man the glow products stall and the snack stall as well as general crowd control. No experience is necessary! If you don’t have the time to join the PTA, please consider helping out for an hour at one of their events. If you are able to help with the Year 1 and 2 disco, please could you either contact the PTA directly at StMartinsPTA.gg@gmail.com or let your child’s class teacher know. The children have spent this week in their new phonics groups so we hope they are enjoying moving to different teachers. It has been lovely getting to know children from different classes. We have been practising letter formation and the children are working really hard. We will be continuing to go over the formation over the next few weeks. Next week in numeracy we will be learning to find 1 more and 1 less. We hope that the children enjoyed Rainbow Maths Day today. They looked great dressed up in all their bright colours! This term we will be working on number bonds. In a couple of weeks, after completing some work on number bonds in class we will be sending out their own individual Rainbow Maths Targets. We have a school subscription to a website called Skoolbo which is a fantastic resource for consolidating literacy and number skills. The children will shortly come home with a letter which will contain information on how to access the site along with passwords. We will explain how the site works with the children beforehand. As part of our topic this term ‘All about me’ we would love the children to share a place in Guernsey that they like to visit or spend time at. These photos will be put up in each of the classrooms on our Guernsey map displays. As there will be quite a few photos coming in please could the photos be either a standard 6 x 4 size or feel free to email them to your child’s class teacher. If you don’t have our email address please use the ‘contact us’ form on the blog. Over the next few weeks we shall be doing some observational drawings and activities on the theme of autumn. If you are out and about and find any conkers, acorns, sycamore seeds (‘helicopters’) pine cones or beautiful crispy autumn leaves etc then we would love to have a few brought into school to use in our classrooms. Just a quick reminder that tomorrow is our whole school Rainbow Maths Day. The children can come to school dressed in brightly coloured clothes to launch our targets. We are really pleased with how the children are settling in and beginning to learn all the new routines. In our literacy lessons next week we will be continuing to work on letter formation and writing names using the correct formation and use of upper and lower case letters. We will be beginning phonics next week. Children will be in ability groups for phonics and may be taught by a different teacher. In maths next week we will be continuing our work on counting and ordering numbers. On Friday 22nd September we are launching Rainbow Maths Targets across the school by having a rainbow day. Children may come to school on this day wearing bright colours or rainbow colours and we will be doing lots of activities in continuous provision to introduce the children to number bonds which our targets for this term will be based on. We will be sending individual targets home for your child later on in the term. If you still haven’t returned your flu consent form, the deadline is MONDAY 18TH SEPTEMBER so please could you ensure that it is returned by this date. We have come to the end of our first week in Year 1 and we are really pleased with how the children are settling in. As a school, we have revised our handwriting policy and will no longer be teaching children the cursive script. Your child will be bringing home a copy of the letter formations which we will be using (these are the same as they were taught in reception, just without the hellos and goodbyes. eg. around the apple and down the leaf). Next week we will start to introduce these to the children. If your child already writes using a correct cursive formation we will still encourage them to use this. We will also be encouraging the children to write their name using the correct formation and use of upper and lower case and will send home a name card for them to practice at home. In maths next week we will be learning how to count numbers of objects accurately. Children could practice counting things at home eg. How many pencils are in a pot? How many lego bricks do they need to make their model? Here are a few reminders about routines in Year 1. Please remember that children now need to bring fruit in for their morning snack as it is no longer provided by the school. This should be fresh fruit or vegetables. Please could it be in a named pot or bag. The infants start school in the morning at 8.55am. Teachers are on duty outside in the area by the climbing frame from 8.45am and they will go and open the doors when it is time for the children to line up to come in. We are continuing to encourage children to unpack their bags and put away their belongings independently. To help with this, we request that you say goodbye to your child when they go to line up at the door rather than coming inside with them. If your child goes to breakfast club, please could they hang all their belongings on their peg before breakfast club and then they can independently unpack their bags with the rest of the children when they come into class after breakfast club. Children have currently been given books on the same level that they finished Reception on. Over the next week as we spend time reading with each child individually we will revise this as necessary. Please bear with us during this time but we welcome any comments you wish to make in the reading record. No formal written homework tasks will be sent home in Year 1. However, in the weekly note we shall include details of practical activities or websites/apps which you can use at home to support your child’s learning; particularly for maths. Like the rest of the school, in the next few weeks children will also be given Rainbow Maths Targets. Separate information will follow on these. Children may bring wellies into school to use when they are learning outside. Please could they be named clearly. Could we also ask that a suitable coat is brought to school every day as we do use our outdoor environments in all weathers. This year, we will be choosing a Star of the Week each week. Please click here for more information. Thank you to all of you who have so far offered to help with swimming lessons. We are still short of a few people if you are available during your child’s class slot. If there is anyone who could spare some time to come in to listen to children read then this support is also invaluable. Particularly useful times are first thing in the morning or during assembly from 2.30pm onwards as this does not disrupt lesson time. Please let your class teacher know if you can help. We’ve had a lovely day today in Year 1 and we hope that your child enjoyed their first day. We are always grateful for any parents/grandparents who are able to come and help out in class. We need help on a regular basis with swimming and to hear readers (a good time for this is at 2.30 so if you find yourself sitting in your car waiting for your child, why not come in and listen to some readers?) or to help out occasionally with trips etc. We are also looking for some volunteers who can help with the upkeep of the Year 1 garden (outdoor learning environment). We need help to keep on top of the weeding and pruning of vegetation so that the children are able to enjoy learning in the area. We also have some beds which we use for planting with the children. We like to involve the children as much as possible to help as it is a good real life experience for them. If you (or a family member or friend) can spare an afternoon a week or would like to come in every now and then, to help with this we would be really grateful. If you are able to help in any way, please speak to your child’s teacher. We look forward to seeing you on Thursday evening (7th September) at 7pm for the parents information evening. We are looking forward to a busy and exciting year.